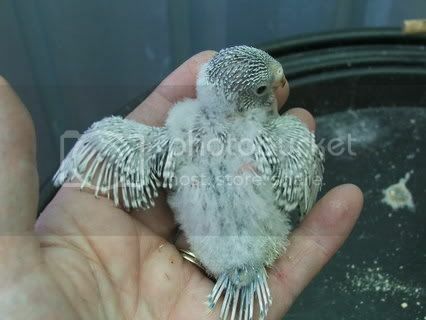 Baby no 3 has turned out to be a skyblue or cobalt spangle ! and baby 4 is maybe cinnamon too and looking green like baby number one. 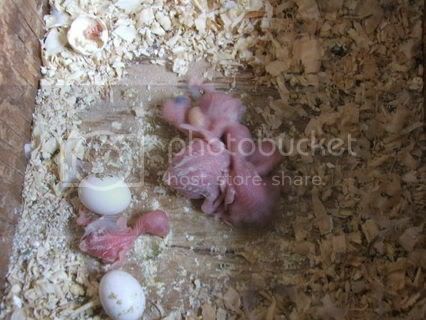 Precious and Spot now have 4 babies with one newborn which seems to have plum coloured eyes ? 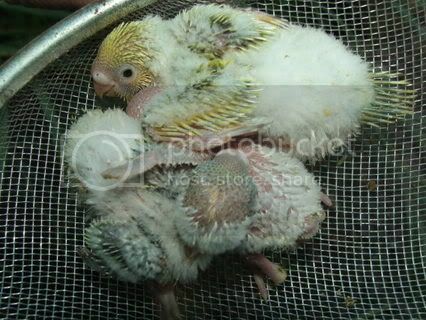 Butter (creamino) and Moon (dom pied) have a baby in nest (one is also in shilohs nest)...but this baby seems all yellow with dark eyes so far. 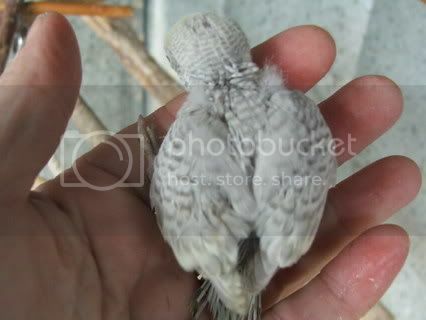 In Swifts nest is 4 babies, one a lutino ! 1 is looking pied ? maybe and 1 newest baby has plum coloured eyes ? other not sure yet. 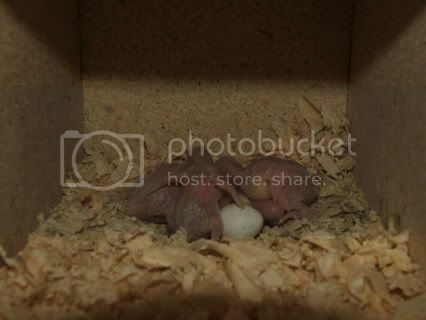 Jade and Goliath (parents of Crystal) have 5 eggs. 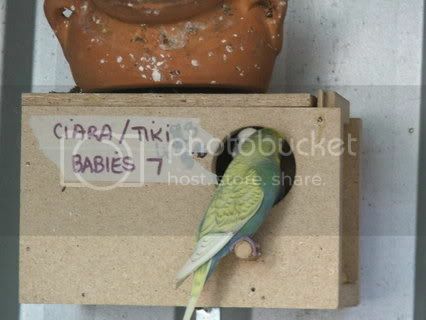 Ciara has 7 babies and all doing well. One is definitely a dominant pied if I am correct....1 looks DEC or similar and others to be determined. Theres seven babies in these two piles !! Pity help the little ones underneath !! and then there's more...but they can come later. Pretty Babes and hope you have returned from cyberspace permanently! oops sorry for getting the links wrong with some of the pictures (Laughing out loud). It was late last night I should have checked them all. oops sorry for getting the links wrong with some of the pictures lol. It was late last night I should have checked them all. 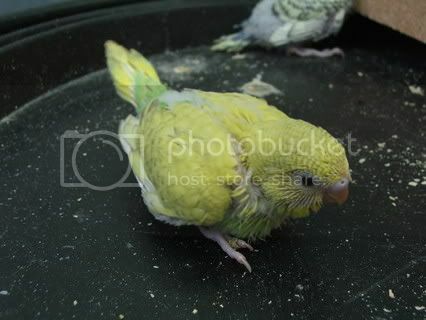 Keesha - cinnamon light green spangle - agree, no green on wings means no opaline. swift - 1 is looking pied - yep I can see that. 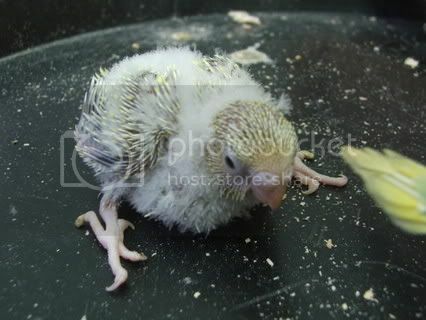 Cookie and Casper - one may be albino - or YF Ino, this one will be a girl. 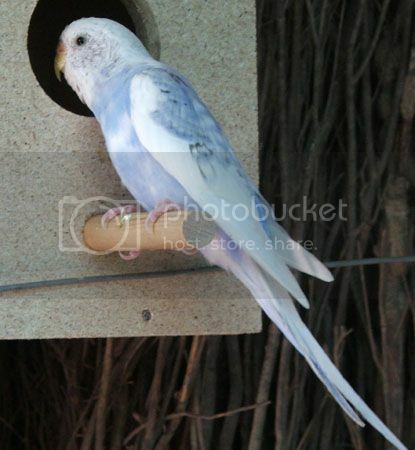 I like that picture of Laila looking in the box so cute. So many babies....are you selling any this time around?? It's really hard to part with the babies Lovey but I must of course. I will keep my selection of them and have to rehome others. 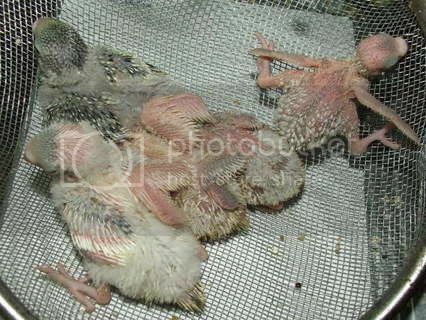 But I won't sell to petshops so it has to be by private sales. Just tops up the birdseed on occasion but not to any commercial degree. 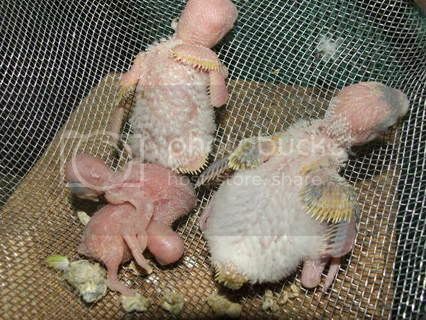 All the mothers raising clutches right now get a long break after this. 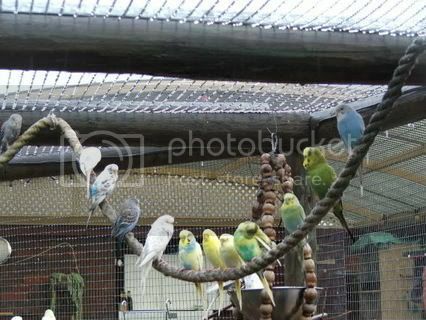 And "new digs" if we can get the new aviary modifications done while Ken is on holidays. 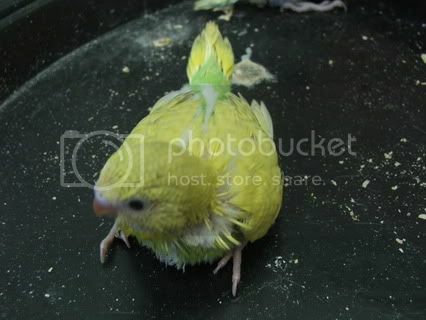 The thing about petshops is....even the best of them put the newest batch of babies straight in with the others. 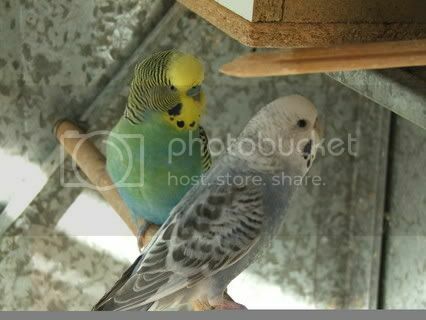 All my care and attention is for nothing if my babies sit alongside another bird that may be carrying a disease. I bet, I can't imagine parting and you are so involved with them it shows just by all your posts and knowing who is who. A break will be well deserved the birds they can enjoy just flying around and basking in the sun and preening . I totally understand the pet store thing that is very true. Last time I was at Petmart I saw to baby babies cuddle together I just wanted to scoop them up and take them home as they were cuddled in the corner. I bet they just put them in that day. Well keep us updated on your rehoming, I want to hear how you do it and how it works. It will certainly be a good learning for all of us so we know what happens. Good thing I don't live too close (Laughing out loud) - my husband would kill me :fear I could never decide which one I should bring home and which one I shouldn't. Cheeta is lucky but then again she has to resist that tempation to bring yet another one home . 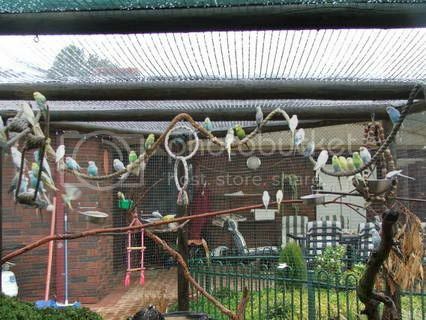 My budgies LOVE rainy days !! This was yesterday and they all get excited over rainy days. These were taken before most of them got wet. Kirby...see Goliath and Jade far right. 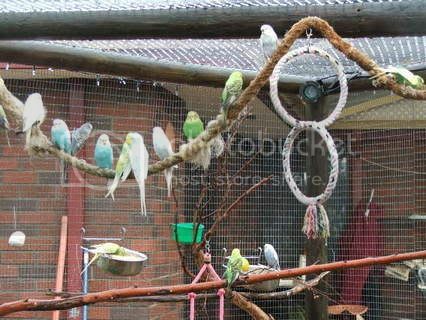 note...they all like the rope perching best !! As usual gorgeous pictures. I must be PMS'ing because I'm getting a little teary eye'd at the beauty of all of those birds. 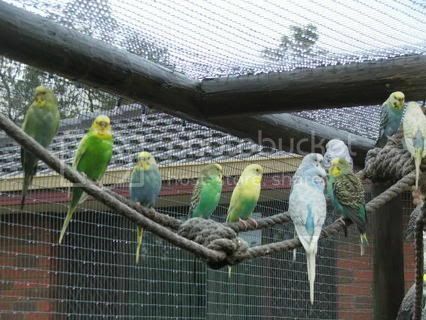 I'm sure a flock of wild budgerigars would be amazing too, but that mix of colours really does it for me!! Looking forward to seeing more baby pics. 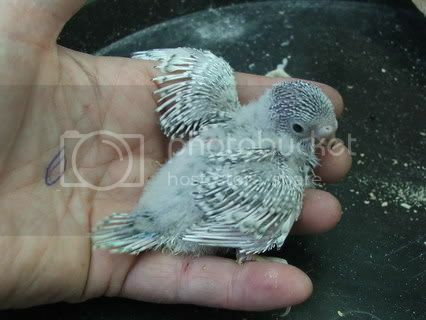 Is the dilute baby fully feathered yet? 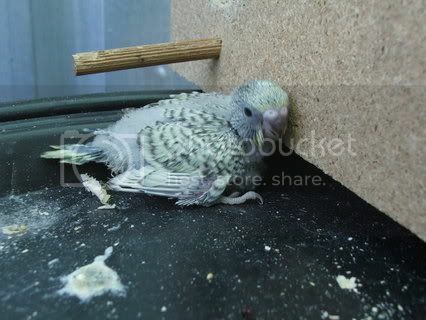 The eldest dilute baby...the one with the blue feathers on its body, died in a nesting box accident :fear The youngest dilute baby looks just like the mother I will try for better photos in a few days. Cheeta is lucky but then again she has to resist that tempation to bring yet another one home . (Laughing out loud), yeah another one will probably come home after I get back in September from my one month holidays. I do trust Karen's flock, but I still go ahead with the quarantine process, but because my housesitter and animal sitter aren't familiar with the whole birds scene I didn't want to overwhelme her too much while she's here. so opted to wait out until the holidays when we get back for another baby if my hubby lets me.. hehe.. There's already some that tug at my heart string, but my eyes are still set on Buddha, but I know I could never have him.. hehe. 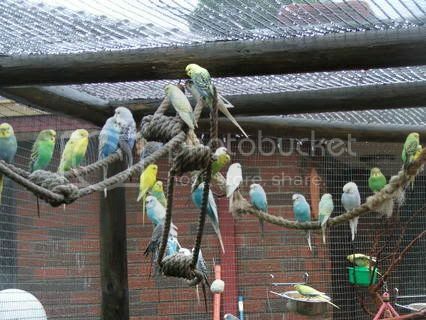 Very nice photos My budgies have rope perches too and they love them. Oooh, so glad Punky can't read!!!!! :fear My son absolutely adores Punky - who still can't fly!!!!! On another subject....Amara came out of hiding today from her nest behind the wall with eggs and babies. Poor little love had cramp from being tucked away with no exercise and wasn't flying too well. 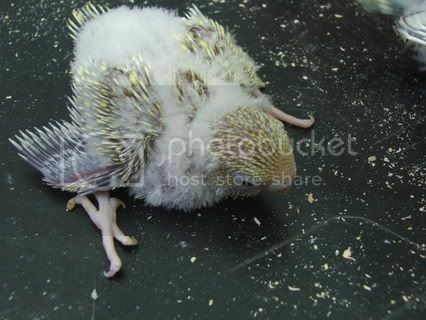 It meant, though, that she accepted help being picked up and lifted onto the food tray and perches. She can fly, but she is a bit stiff. I have a plan to check on her nest with babies. I am making a hatch door to resemble the area she has chosen to have her babies....then I will cut away the brushwood ( in a section same shape as the new hatch door) where she is. Quickly check all and put the new hatch door in front taking the place of the cut away thatch wood. Then I can check all anytime I like and shut the door giving her privacy. LOL, yeah another one will probably come home after I get back in September from my one month holidays. good thing you got them out I wonder if it was because of the place she was hiding them and it was hard to feed them? Karen you must let some of the other go too (Laughing out loud) not just the rejects (you know I am kidding . Karen you must let some of the other go too lol not just the rejects (you know I am kidding . I think its possible a mouse found their hiding spot and drove Amara from the nest. There was mouse tunnels that side of the aviary some weeks earlier, so it possible. They dig their way in when its rainy. One baby had a bruise to its "shoulder" like it may have been bitten by something or did it on the brushwood. But they were stone cold and needed feeding and warmth. I will check on them with Spice later and see if they are better. 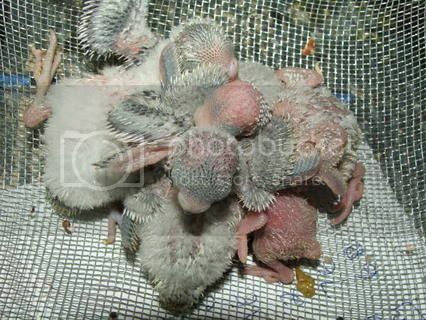 Spice and Pepper will probably only have grey babies anyway and they only have one baby of their own in their nest. Hopefully Spice will just get on and feed them. I would expect to lose one or two of these babies if I found them too late. 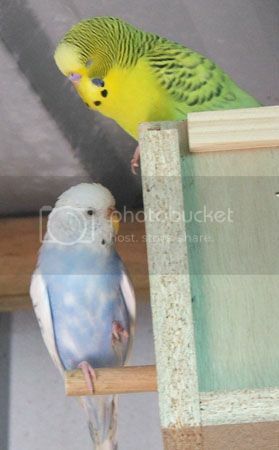 I have also caught Amara and her boy and caged them together away from the aviary. Do you know, anyone from this forum would be welcome to adopt any of my babies not "already spoken for" ....you guys just all live too far away. 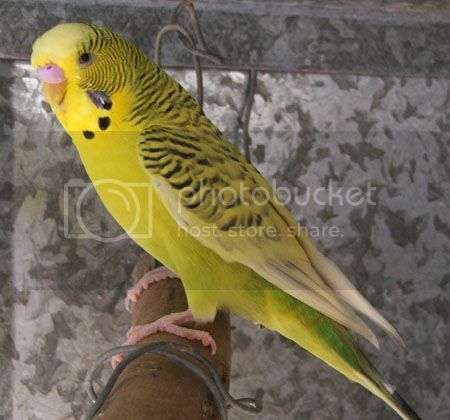 Cheeta and Lin would have been given more budgies, but Cheeta especially can't have any more right now due to space requirements. 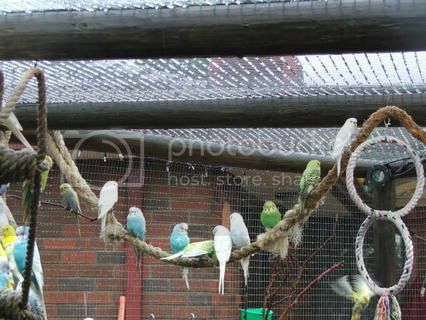 :fear Glad the rescued babies are okay Bubbles and I love everybody sitting in the rain on the rope perches, hope old what's his name (the rope)got a good rinsing! I moved the rope....and since then, no more activity So far, so good on the babies. Spice seems very pleased with herself with more babies to care for too. She lost some of her eggs previously when we had a mouse problem and they went through some nesting boxes driving sitting Mums off eggs.